The Model of Coordinated Action (MoCA) represents a bold initiative to leverage ethnographic or qualitative research in the field of Computer Supported Cooperative Work (CSCW) in an unprecedented manner. By finding a way to compare studies of practice, we aim to contribute to the generalizability of previously generalizable findings and also to the production of data-driven design guidance that is tailored for different kinds of collaborative settings and organizations. MoCA is a conceptual framework for describing complex collaborative situations and environments including, but not limited to, collaborations that have diverse, high-turnover memberships or emerging practices. 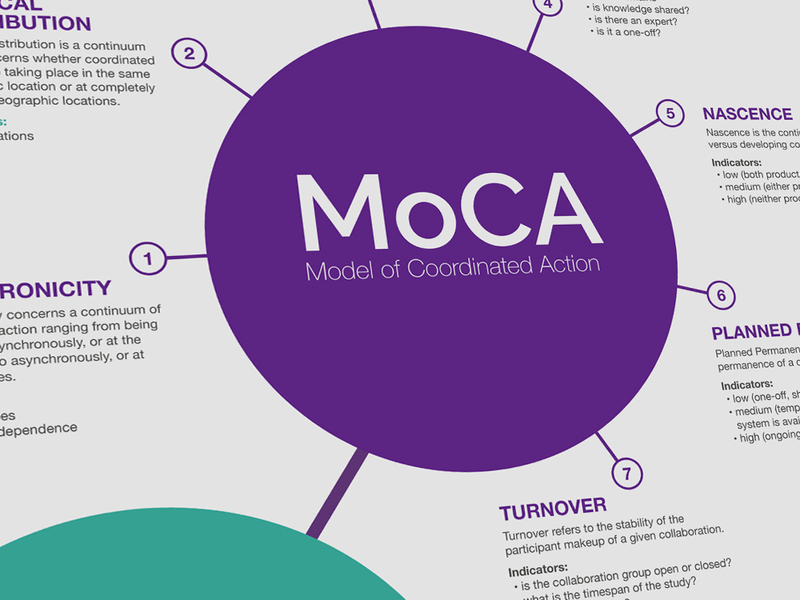 MoCA consists of seven dimensions of coordinated action. Each of these “dimensions” fall on a continuum. This new conceptual mapping of types of collaborative work enables a fuller representation of the design space for collaborative systems. By focusing this model on collaboration per se, we open up more room to investigate how multiple technologies can be mapped to a single coordinated action—a sociotechnical aggregation of actors and technologies. Contemporary design practice is in flux. 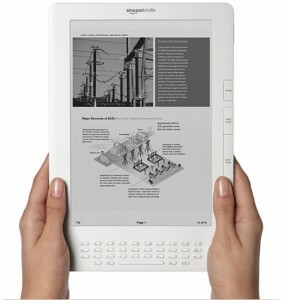 It continues to become increasingly collaborative and dependent on a proliferation of software-driven modeling systems. The advent of more affordable and ubiquitous modeling software, especially 3D CAD, in design fields such as Architecture is causing massive ripple effects on design practice. Each modeling system favors different concerns and ways of working. 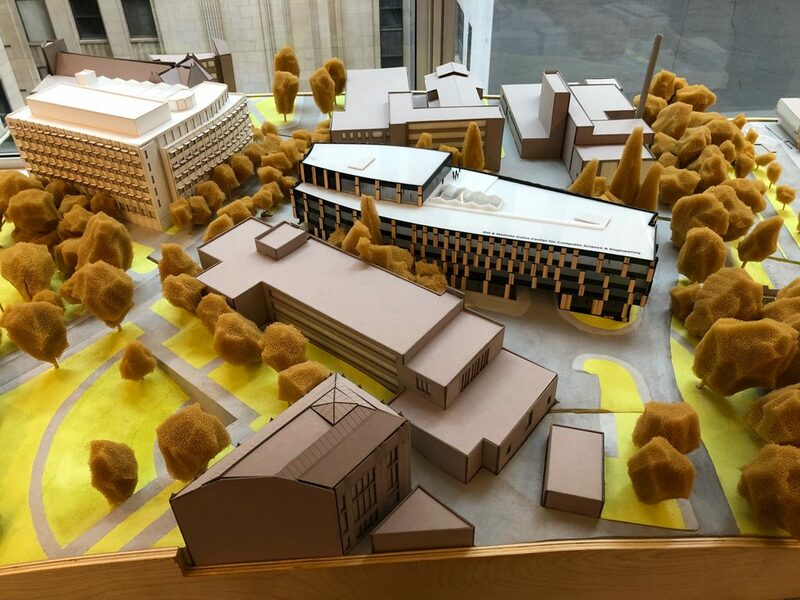 Engineering friendly Building Information Model (BIM) software has taken many design fields by storm yet recent research has called in to question its effectiveness for supporting conceptual design. In contrast, more accessible modeling systems such as Rhino, designed to be more similar to drawing and their related practices, have also become ubiquitous. Some larger firms find not only both, but multiple systems, in one project. Adding to the collaborative complexity is that traditional, analog modes (e.g. paper sketches, printouts, and scale models) continue to be necessary and useful. As a part of a larger effort funded by the Simons Foundation called Simons Collaboration on Computational Biogeochemical Modeling of Marine Ecosystems (CBIOMES), we are helping scientific stakeholders come together to design and develop shared understandings, priorities, practices, methods, software tools, and computer architectures that will lead to the development of a data repository. 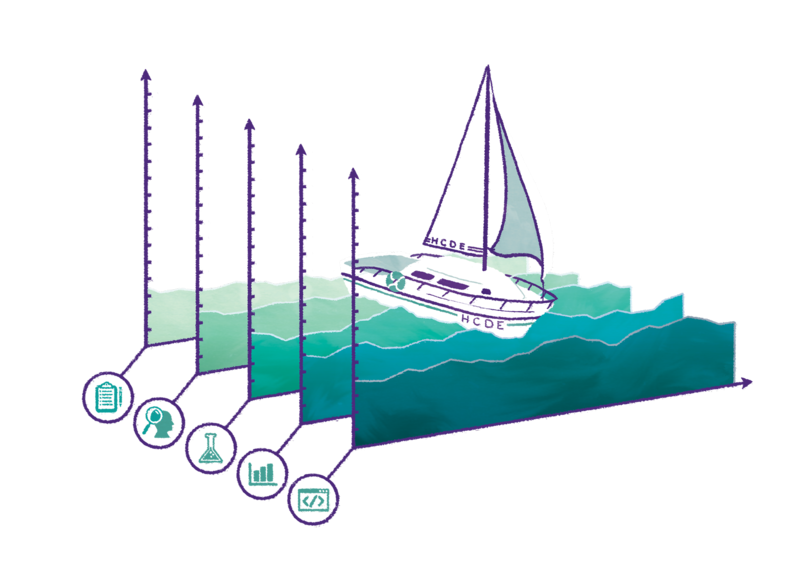 The project brings together a multi-disciplinary group of investigators from oceanography, statistics, data science, ecology, biogeochemistry and remote sensing among others. Graduate student Drew Paine helped co-author this proposal. This research project will examine how scientists develop Scientific Cyberinfrastructure Software (SCIS) as part of their day-to-day research practice through a qualitative, ethnographic study of 6 research groups using observations, semi-structured interviews, and document analysis. Despite the importance of SCIS for data-intensive research, too little is known about how scientists use, adopt, and develop scientific software. More research is needed to explore how software, software development, and software sharing practices are, and can be, community products, resources, or practices. Understanding SCIS development and sharing is necessary to ensure continued integrity of datasets shared within and among communities, facilitate the sharing of the tools and practices that are developed using national research funds, and most importantly continue to support a fundamental tenet of scientific research: the open communication of the processes and practices behind published research findings. This research will develop a framework to understand the set of sociotechnical relationships that comprise cyberinfrastructure (CI). The technical challenges of cyberinfrastructure are already so demanding that projects often have little time to engage reflexively on how cyberinfrastructures are used and created in the current state of rapid scientific change in which the necessity of data sharing and multidisciplinary approaches is putting pressure on disciplinary boundaries. This project will investigate: How scientists and engineers decide which cyberinfrastructure resources (e.g. databases and tools) to use and under what circumstances; Under what circumstances do scientists and engineers decide to create their own resources; How are scientists and engineers mixing disciplinary practices within their own laboratories; When do scientists and engineers adopt hybrid identities (e.g. computational biologists and bioinformaticists). Currently in its third year the Interacting with Cyberinfrastructure in the Face of Changing Science study has enrolled six different research groups as study sites. The disciplines of these six groups range from biological sciences to astronomy and seismology. Examining the work of the six groups, this research is currently examining how data and software artifacts support the collaborative work of these scientists. Specifically the research team is probing how different sources of data may help to structure collaborative work by using the concept of coordinative artifacts from the field of CSCW. This project examines the social processes in the design of cyberinfrastructures, focusing on the role that different stakeholders play in design and development, the ways in which their interests and priorities can be aligned, and the social organization of the development effort. More specifically, this project examines the development and evolution of the GENI.net cyberinfrastructures (PlanetLab, ProtoGeni, ORBIT, ORCA). The goal of this research is to develop a framework for understanding how cyberinfrastructure designs emerge and evolve over time (to that end, we are looking into various theoretical approaches beyond the “dominant design” approach that we originally proposed). We are conducting a qualitative study of the interactions between developers, experimenters and other GENI stakeholders, and of their involvement in the design and development processes across its four cyberinfrastructures. The long-term goal of our research is to contribute research and practical knowledge to the area of cyberinfrastructure design and large-scale IT development. Food systems include a wide variety of things from seeds and soil, to tractors, to farmers and their communities, to consumers and their communities, to people, businesses and factories that grow, package, process, distribute, or consume food. Understanding food system infrastructure is important for ensuring equal access to healthy, safe food. More abstract things like culture and policies can also be part of a food system. Farmers markets are a small part of a larger food system, but as a point of confluence for many food system stakeholders, they are a promising place to start working towards sustainable and healthy food practices. Using ethnographic methods and a grounded theory approach, we interviewed and observed low-income parents who were eligible for government food subsidies while they shopped at farmers markets. The findings presented here illustrate the information needs of a low-income people that shop at a farmers market and explore the implications for technologies that may better support the practices of low-income parents looking for affordable, fresh food and vegetables and that help sustain farmers markets. Although it is tacitly recognized that a good Coordinating Center (CC) is essential to the success of any multi-site collaborative project, little study has been done on what makes a good CC successful, why some CCs fail, or how to build a CC that meets the needs of a given project. Collectively, there is a great amount of knowledge on CCs in the scientific community, yet that knowledge is not being recorded and shared in a systematic, scientific way. The long-term goal of our research is to make collaborative biomedical research, especially cancer-epidemiology research, more efficient and effective through greater understanding of how the research is done and how it can be better supported. We want to find ways to minimize the administrative burden of collaborative research and leave investigators more time to focus on their science. The four aims of this study are (1) Identify and describe models of CCs and corresponding models of collaborative cancer-epidemiology research projects; (2) Develop metrics that CCs can use to predict and evaluate their performance; (3) Build a downloadable toolkit to help CCs ramp up their operations efficiently and effectively; and (4) Produce a modular course to develop and train CC staff. In addition to the aims mentioned above, Betsy Rolland (HCDE PhD student) will also be seeking to answer the question of how coordinating centers facilitate collaboration among diverse sites around data harmonization and biospecimen sample sharing. This will serve as her dissertation research. Cyberinfrastructures are large-scale distributed scientific enterprises supported primarily through advanced technological infrastructures such as supercomputers and high speed networks. This project systematically studied the actual practices of cyberinfrastructure development and use and is also examining the transformations that it is created to engender. Ethnographic methods were used including participant-observation and semi-structured interviews. A nascent metagenomic cyberinfrastructure project served as the field site. This project is undertook an unprecedented 18-month comparative ethnographic study of two large cyberinfrastructure building and research organizations: the National Center for Supercomputing Applications and the San Diego Supercomputer Center. Each of these organizations hosts and participates in multiple cyberinfrastructure projects of varying size and complexity. Qualitative research methods included participant-observation and semi-structured interviews to understand how work practices change and develop over time. Calendar sharing is complex because it involves sharing among people who have very different types of relationships and who engage in very different types of activities. We know that people use online calendaring systems for many reasons other than scheduling meetings or activities, but little is known about these other behaviors. We used Google Calendar (GCal) as a technically constrained field of activity that has social implications for the people who use such calendaring systems. This study investigated how people negotiate their activities and relationships through calendar sharing. The results of this study were written up in two papers presented at CSCW 2012 and 2013.